Hyundai Auto Canada Corp. and Mazda Canada Inc. recently reached a significant milestone with two million sales since they opened for business in Canada. Hyundai hit the mark in early May, delivering a 2016 Tucson 2.0L Luxury AWD to a customer via Hyundai Val-Bélair in Quebec City. In mid-March Mazda’s milestone vehicle, a 2016 Mazda3, was sold by its largest volume dealer, Albi le Géant Mazda in Montréal suburb, Mascouche. “Two million total sales is an achievement only a handful of automotive brands have been able to reach,” said Don Romano, Hyundai president and CEO in Canada. 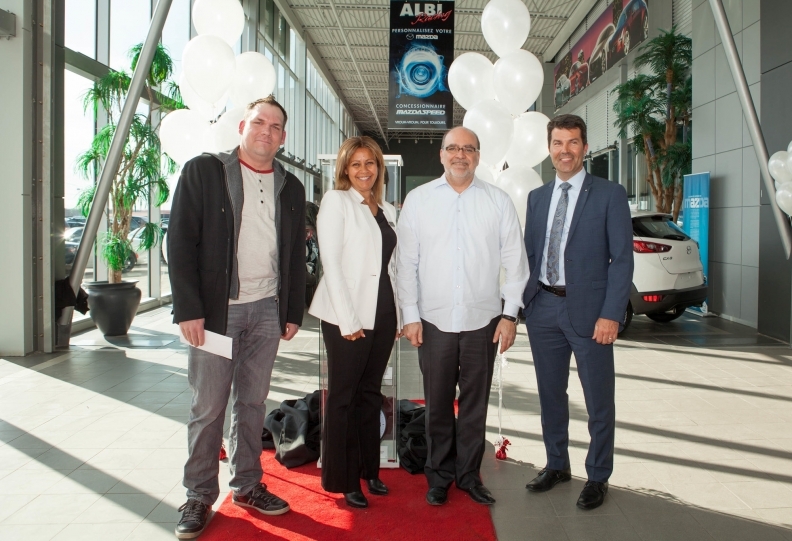 Bruno-Pierre Gougeon, owner of the two-millionth Mazda sold in Canada stands with Rania Guirguis, Mazda dealer business manager, Quebec West, Denis Leclerc, owner of Albi le Géant Mazda , and Jacques Parent, Mazda regional manager, Quebec West. Topping the two million mark is noteworthy, but both automakers have a long way to go to match the levels attained by the Honda Civic and Toyota Corolla. Now in its tenth generation and holding the title of Canada’s best-selling car for 18 consecutive years, Civic sales alone in Canada have exceeded 1.9 million units since the company’s Alliston plant opened in 1988. More than four million Honda vehicles in total have been sold in Canada. Better than five million Toyotas have been sold through its 286 dealerships, including more than 1.4 million Corollas since the first model went on sale here in 1967. Hyundai President and CEO Don Romano (left) and Director of Sales Steve Milette (centre) surprised customers Jean-François Belanger and Melissa Baker with a free 5-year lease of their 2016 Tucson SUV. 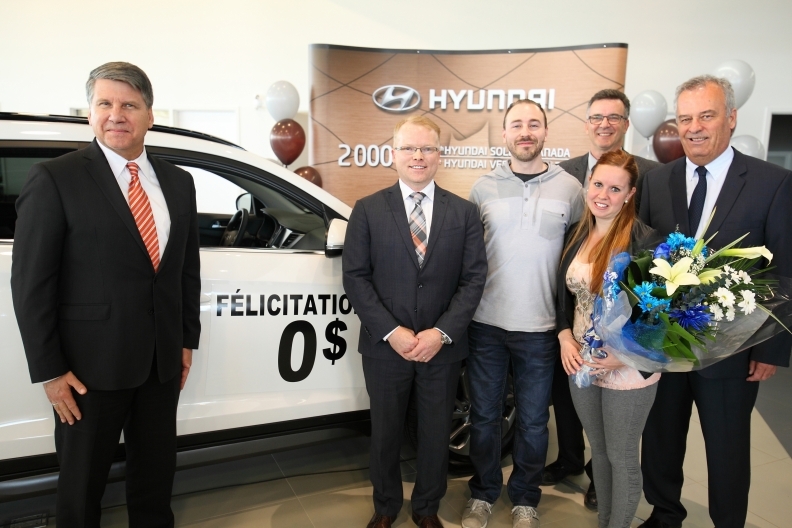 They were accompanied by François Trudeau, district sales manager with Hyundai and Denis Michel, dealer principal with Hyundai Val-Bélair (right). Mazda entered the Canadian market in 1968 with less than a thousand sales in its first year, hit 10 thousand sales a mere three years later and topped 50,000 annual sales by 1991. To reach one million sales took Mazda Canada 34 years, until September 2002. It took less than half that time to top the two million mark. In Hyundai Auto Canada’s case, 24 years and three months were needed to hit one million sales, but exactly a third of that -- just eight years and one month -- to reach two million sales. Today, Hyundai is one of the country’s highest volume brands, having sold 461,778 passenger cars between 2011 and 2015 -- more than any other brand in Canada. A powerful driver behind that statistic was the recent delivery in Montréal of the 500,000th Hyundai Elantra sold in Canada, a 2017 GL model. Initially launched in 1991, the Elantra -- which debuted in February in all-new sixth-generation form -- has risen to become Canada’s second-best selling passenger car. To mark each special occasion, Hyundai’s two-millionth customer received a free 5-year lease while the buyer of the milestone Mazda3 got two years of payments waived, along with two years of complimentary maintenance.